Been using Iscore for 7 years and loved it. This was a great app because it was free for my family to watch it when they weren’t there. Now that they’re charging a fee per device, it will cost my family more than GameChamger. Guess I’ll go to that. Great app takes a little time getting used to it but once you do like it much better than GameChanger. 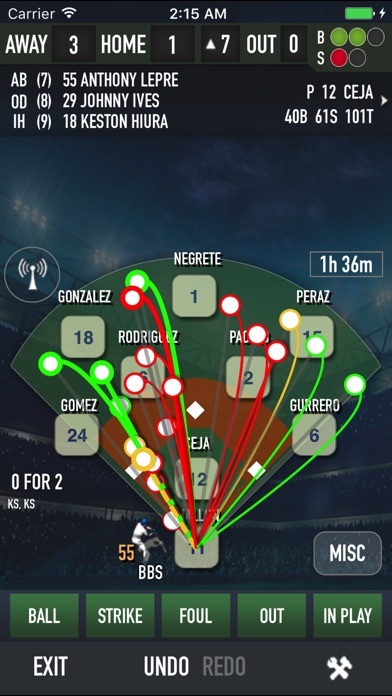 I test-drive this app to track my son's all-star team. When I tried to create a new player after entering the first, it overwrote the first player with the second player's info. Seemed like there were similar problems trying to enter team info. Going to try something else. For those who use it to score MLB games with the roster and lineup features, some of the default questions, like what happened to runners when the batter Ks, seem counter intuitive. Why not assume no advance and allow the user to input those few times a runner advances are is thrown out? Getting better than it first was, but should have a setting for MLB games to eliminate questions more appropriate for a little league game. Also the edit function should allow an edit without limits. Right now too many things are not capable of being edited. Also, the app doesn't seem to realize that save opportunities may exist for both teams. Three years after my first review many problems remain. This app just keeps getting better. The interface has improved to the point that I can hand off my device to another parent to score the game while I coach. They only need 5 minutes of tutoring and they are good to go. The new settings for game set up allow for kids softball games to have coach pitch and kid pitch. So helpful. Thanks. Most robust cost effective version for ipad/iphone..great app, great support. Developers continue to evolve the app over the years i have used it. check out their support forum to see great customer service. You will also find, requests and concerns get addressed through new feature releases. 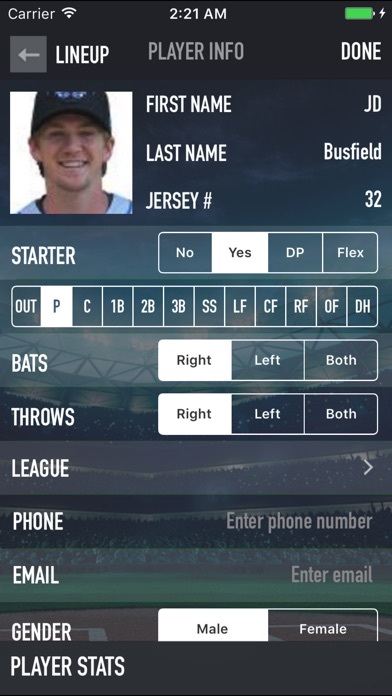 If you have an interest in using your iPhone/iPad to score youth baseball and softball games and then quickly turn that into stats for others to see- this is very robust. . You get to keep all your scored games on your device. I have used the app for several years. Since this update, the app Created a new account ID and now I don't know how to get my old ID back! Please help! I put in an email and haven't heard anything back yet. I'm on the middle of a baseball season and need this fixed ASAP! This is a great app for keeping score, but you have to pay $20 every year for MLB rosters. Really? You would think they could charge less or better yet let you download them for free. It’s just crazy!!! This is a great app. You really have to stay in the game so as not to miss situations, and it can be hard to record situations when multiple issues occur on the field at once. ie multiple errors on the same play. The means to record such issues is tedious and can be confusing. I also wish there were more export options for stats. Allow us to export data directly to excel or csv. This is by far the best app I've found for keeping score as it includes the ability to track all stats easily. The only down side is that it really drains my phone battery making it difficult to score a game that goes past the 3.5 hour mark. This tally's everything up so I don't have to. Scoring is simple and you can fix errors easy as well. Takes a little getting use to but it's great! Thanks! Always keep score at the game. Used to do so with a pencil. Not any more. Simply awesome. I'm a season ticket holder at a Single-A MiLB team and use this app at every game. Easy to use, and quick. Shows me what the opponent batter has done in previous at bats. The add-on service has rosters and stats for both MLB and MiLB teams. That saves me having to type in a few hundred players every season. If you're into scoring baseball games, or want to be, get this app. 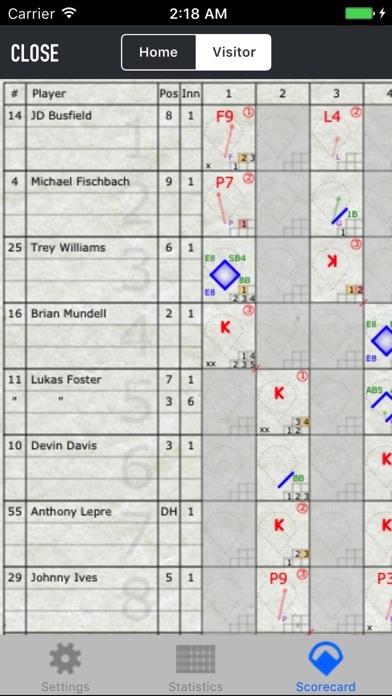 This is the coolest, easiest, and best way to score a baseball or softball game then when you're done it compiles and calculates game and season statistics for you. Also creates PDF scorebook pages that can be e-mailed and printed. Great package, easy to use and parents love the online stats. This app is my favorite, I use it, not just for my own baseball games, but when I'm at the MLB stadium watching a game, even when I'm playing MLB 2K9!! Excellent App. The little league players and parents are astounded at the end of the season when we produce the players stats as well as the play by play!! I recommend this app that anyone likes to score little league, high school, college, or mlb games. I score my brothers games on this and it is awesome!!! The only problem I have is that it is 20$ for the MLB package and they should lower it to between the $10-$15 range to make more customers buy it. Other wise this app is boss! Excellent! Easy data entry. Accounts for every action during game. Stats are significant for basic analysis and customizable for detailed stats to sort out player performance. Easy to set up seasons, leagues, tournaments for grouping reports. This App will let you manage your teams Stats very easily. Updates are made regularly to improve performance. My app wouldn't let me say "rate later" or "no thanks"
IScore makes accurate scorekeeping possible. Love this app!! Highly recommended from someone who uses this app to score a travel team's weekend tournaments for the coaches. Fast to learn, and easy to use. All stats are utilized for batting, fielding, and pitching. My coaches rely on me for accurate data to make adjustments to batting order and fielding changes. Thanks, fasterthanmonkeys! Love keeping score with this app. It captures all one would need to have a complete score card. When I first got this app I expected to be able to score games and that's all; this app, though, keeps track of and calculates all the stats for you! Easily worth the $10. The MLB Add-On is also a great feature especially since it includes minor league and NCAA baseball now! Easy to use. Very affordable. Great to have instant stats to discuss. Updates are always valuable. Very nice app. I use on iPhone 4s. Loving it so far, as do the families that follow along through the web and twitter! Very easy to use. Much better than pencil and paper. Having accumulated stats available by the touch after the game is fantastic. Does everything I need it to do and more. I like being able to post both game and composite stats within minutes after the game ends which accommodates media outlets. Parents and out-of-town fans really enjoy following games on the iScore gamecast as well. Easy to use. I entered data while coaching third base. Very easy and intuitive. Great for stay recall at any time in the season. Problem getting others trained in using and one expert is not enough. Overall I am very pleased and have approximately 100 games in the system. One feature I didn't expect to be popular is the web interface which allows for a twitter cast and a pitch by pitch webcast of the games. This is especially popular for traveling parents and remote grandparents. This is a great app for a rookie or an expert! I just wanted to keep my daughter stats for to have stats for college recruiters but this app took me to another level!! I Love It!!!!!! Just amazing with almost everything you need to keep any stat you could want for 14 yr old ballers. Our parents watch the iscorecast while at the game and what a great asset for those not able to be there. I've tried others like Game Changer and iScore is so much better. Used it for 3 years now. Keeps getting better. I have tried several apps to keep score. iScore is the easiest and most useful app that I have come across as of yet. GREAT APP! Love this app. Use it for baseball and softball. Took me about 3 games to get the handle of it and now I use it at every game. User-friendly interface, straightforward game/play options, integrated data sharing, and variety of stat choices make this a much better choice than Gamechanger. It's easy enough for a rookie to learn and use (my wife), but provides plenty of data points and stats for the serious analytic mind. Great for coaches to see hitting trends in both stats and scatter charts. The app developers did a good job with the early versions and it keeps getting better. No need to search anywhere else. I score about 3 games a week year round and this app gets it done. Best app out there and EASILY the best customer service! I have used iScore for 5 years now as my boys have progressed from pitching machine leagues to complete baseball. The charts are great. The stats are great. Excellent tool for tuning a lineup, scouting, and cutting through some of politics during Allstar timing. The only thing I would like is more flexibility to edit nonsequentially. For example, starting a game in the second inning when you show up late and adding the 1st in later. Love it! I've used it for every game the last 2 years. My wife scores when I'm not able to and she understands it, it's that easy! The only request I have is this, it would be nice to send a message or display a message box on the scorecast to let the viewers know of any details on a play or anything else. That would make this unbeatable and a big step above the rest! !